Available In: cherry, Maple, Oak, and Pine. Finishes: unfinished, painted, and stained. Finish prices vary. Contact store for details. Picured: a. ALTO223X Paxton Hutch, and b. ALTO171X Sofa Cupboard (Sold Separately). 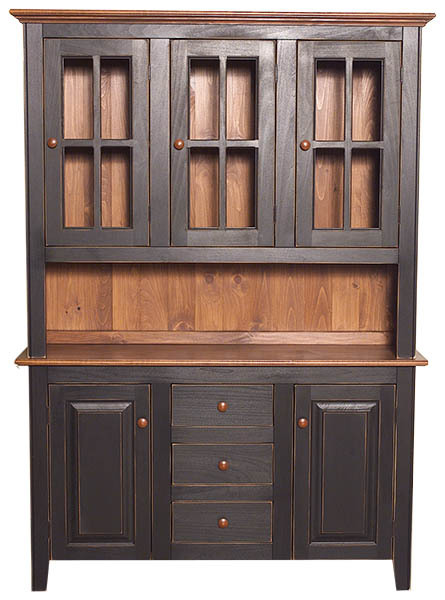 Features: 3 mullion glass doors with solid wood knobs, open server area, and 1 1/2in. beadboard bacKing; tongue & groove (shown here) no longer available. Associated Products: ALTO171X Sofa Cupboard, ALTO205X Berwick Cupboard, ALTO206X Hopwood Cupboard, ALTO211X Woodbury Cupboard, and ALTO601X Dresser.